Can you confirm these amateur observations of Liolaemus alticolor? Type locality: Tihauanacu [= Tiaguanaco], Bolivia, elevation 13,100 feet. Types Syntypes: MCZ 7287 (2) = lectotype (MCZ-R 169004) and paralectotype (MCZ-R 7287) designated by Quinteros 2012. Diagnosis Diagnosis.—Liolaemus alticolor is a small (maximum SVL 54.1 mm), slender species of Liolaemus and is a member of the alticolor– bibronii group. It differs from L. bitaeniatus and L. variegatus in the shape of dorsal scales (rhomboidal in these two species; lanceolated in L. alticolor). The presence of sharply pointed dorsal scales in L. alticolor distinguishes it from L. paulinae and L. tacnae (dorsal scales without sharp points). It differs from L. yanalcu in that this species has the canthal scale separated from the nasal by two scales, whereas in L. alticolor the canthal is separated by one scale. In L. pagaburoi and L. tacnae, there are three scales between the subocular and nasal, and in L. alticolor there are at least four scales. Temporal scales are weakly keeled in L. alticolor, whereas L. paulinae, L. tacnae, and L. walkeri have smooth temporal scales, and L. bitaeniatus and L. variegatus have markedly keeled temporal scales. The dorsal surface of the head in L. alticolor is immaculate (without spots), whereas in L. ramirezae, L. pyriphlo- gos sp. nov. (see below), L. variegatus, L. walkeri, and L. yanalcu there are spots on the dorsal surface of head. In L. alticolor, a black line surrounds the interparietal scale (Fig. 1), whereas this line is absent in L. bitaeniatus, L. incaicus, L. paulinae, L. pagaburoi, L. ramir- ezae, L. tacnae, L. variegatus, and L. walkeri. The subocular scale is white in L. alticolor (differing from background coloration of the loreal region), but this scale exhibits the same color as the loreal region in L. incaicus, L. paulinae, L. puna, L. pyriphlogos, and L. yanalcu. Liolaemus bitaeniatus, L. incaicus, L. paulinae, L. pyriphlogos, L. pagaburoi, and L. variegatus show paravertebral spots, which are absent in L. alticolor. Liolaemus alticolor exhibits dorsolateral stripes, which are absent in L. tacnae and L. yanalcu. A vertebral line is present in L. alticolor, but absent in L. bitaeniatus and L. tacnae, in females of L. incaicus, and in males of L. puna. The throat background color in L. alticolor is light gray, whereas in L. bitaeniatus, L. chaltin, and L. pagaburoi it is cream-white, and in L. tacnae it is melanistic. Also, the throat in L. alticolor shows black spots, which differs from the immaculate throat of L. chaltin, L. incaicus, and L. ramirezae. The reproductive mode distinguishes L. alticolor (viviparous) from L. bitaeniatus, L. chaltin, L. pyriphlogos, L. ramirezae, and L. yanalcu (oviparous). Lio- laemus alticolor is geographically isolated from L. araucaniensis, L. bibronii, L. cur- icencis, L. exploratorum, L. fuscus, L. gracilis, L. lemniscatus, L. saxatilis, and L. tandiliensis. 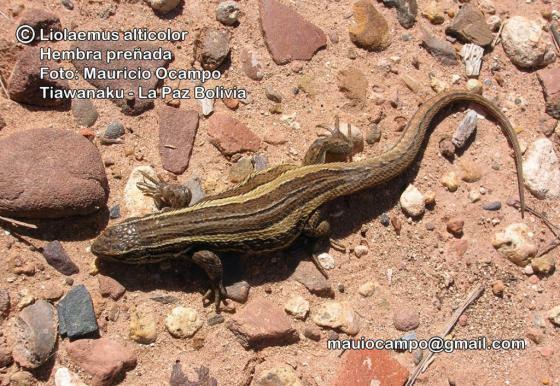 Liolaemus alticolor also has a different num- ber of scales around midbody (39–47) from L. araucaniensis and L. exploratorum (50–76). The number of scales on the dorsum (from the occiput to hind limbs) distinguishes L. alticolor (38–43) from L. araucaniensis, L. bibronii, and L. exploratorum (50–73). Lio- laemus alticolor has 62–73 ventral scales, compared with 78–115 ventrals in L. arauca- niensis, L. bibronii, L. exploratorum, and L. fuscus. Temporal scales are weakly keeled in L. alticolor, whereas they are smooth in L. araucaniensis, L. bibronii, and L. gracilis. Paravertebral spots are present in L. arauca- niensis, L. bibronii, L. exploratorum, L. fuscus, L. lemniscatus, L. saxatilis, and L. tandiliensis, but are absent in L. alticolor. Comment The status and validity of Liolaemus lativittatus is unclear but may have priority over Liolaemus alticolor. 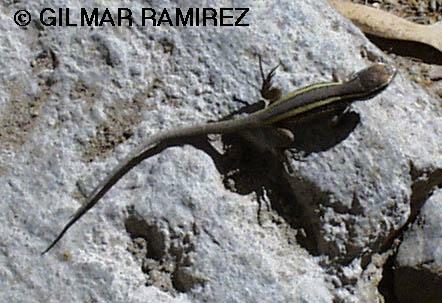 Subspecies: Liolaemus alticolor walkeri (SHREVE, 1938) has been elevated to full species. LOBO (2001) suggests the following monophyletic species groups within Liolaemus: alticolor, altissimus, gravenhorstii, hellmichi, kriegi, leopardinus, monticola, nigromaculatus, nigroviridis, pictus and tenuis. Distribution: not listed for Argentina fide AVILA et al. 2010, or Avila et al. 2013. Argentinian populations may have been assigned to other species. Previously reported from Chile (High Andes of Tarapacá); S Peru; NW Argentina (Jujuy, Salta, Tucuman); but not listed by Ruiz de Gamboa 2016 for Chile. Aparicio, J. 1993. 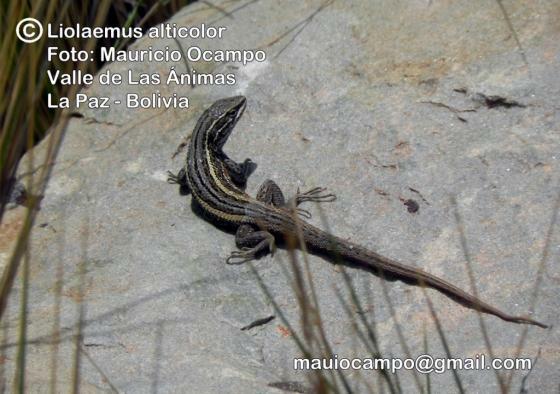 Herpetofauna de Huaraco, un ecosistema andino en el altiplano central de Bolivia. Ecol. Bolivia Doc. Zool.4: 1-38. Donoso-Barros, R. 1966. 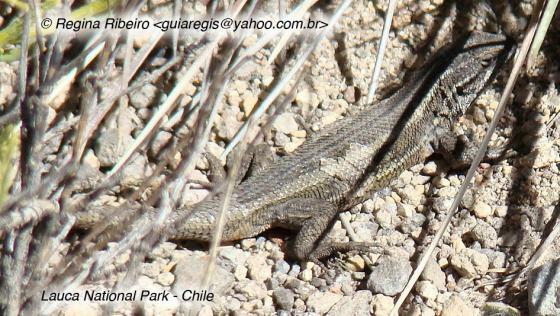 Reptiles de Chile. Santiago: Univ. Chile, 458 + cxlvi pp. Rendahl, H. 1937. Einige Reptilien aus Ecuador und Bolivia. Ark. Zool. 29 (13): 1-19.